Highlight your office décor with the radiant, hand tooled copper panels of this handcrafted, Western style desk. 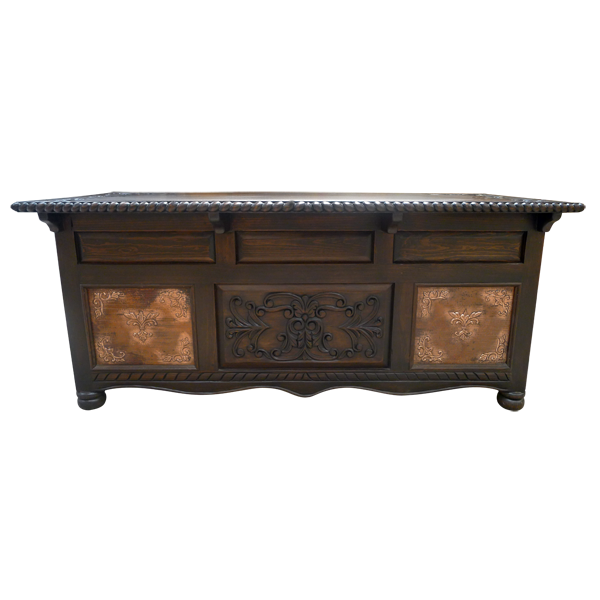 The keyhole style desk has a rectangular, open top and the corners of the top are adorned with hand carved, floral and scroll designs. The top rim is adorned with a hand carved, twist rope design. The front of the desk is embellished with six, beveled panels, decorated in different styles. The three small, top panels have rectangular cut designs, and the large, center panel is has opulent, hand carved, floral and scroll designs. The two remaining panels are on each side of the lower front of the desk, and each panel has luminous, hand hammered copper with exquisite, hand tooled copper floral details. The front of the desk has a solid wood, curved apron, with a hand carved, twist rope design above. 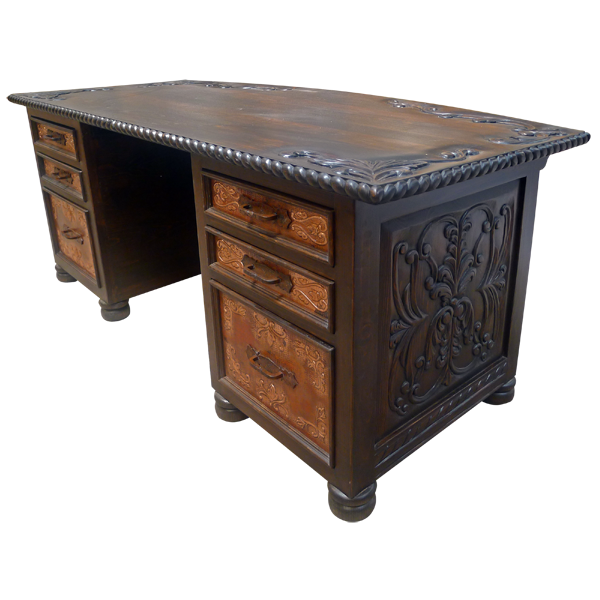 Each lateral side of the desk has a rectangular cut design, adorned with hand carved, floral and scroll designs. On each side of the desk are three rectangular drawers, and all of the drawers have a hand hammered and hand tooled copper panel on their front, and each copper panel has marvelous, hand tooled, scroll designs. The lower two drawers are the largest, and each drawer has a hand forged, iron handles in its center. The desk rest on hand turned, bun style feet, and it is made with the best, sustainable, solid wood available. It is 100% customizable.